Stout, well-branched biennial thistle that grows from a rosette that can be very large, to a well-branched 'shrub' up to 1.5 m tall under fertile conditions. Composite flower heads up to 5 cm across, purple-coloured, later producing seeds with a mass of pappus hairs or thistledown. Leaves are hairy on both surfaces, and have spines on the upper surface. Probably the most common thistle in New Zealand. Flowers Reddish-purple, up to 6 cm long by 5 cm across, solitary or in two- or three-flowered terminal clusters. Outer bracts (small green, leaf-like structures forming the outside of the flower heads) slightly woolly-hairy, each with a strong spine about 4 mm long. Flowers Nov-Mar. Fruit Narrow, egg-shaped, pale achenes about 4 mm long by 1.5 mm across, each with a feathery pappus 20-25 mm long. Leaves Dark green, to 30 cm long by 10 cm wide, prickly-hairy on upper surface, white-cottony on underside. Deep lobes tipped with strong spines. On flowering stem, lower leaves are stalked and those further up are stalkless. Stems Stout, erect, furrowed, branched, with spiny wings. Pasture, waste places, arable land, disturbed forest and road-sides. Widespread throughout New Zealand. Originally from Eurasia and north Africa. One of the most abundant thistles in NZ. In pasture it seems to be strictly a biennial, germinating in winter or spring, surviving its first summer as a rosette and then flowering in its second summer. It is rarely eaten by sheep or cattle, but goats will graze it once it has started to flower. Appears in very large numbers after fire or soil disturbance. Subject to a Pest Plant Management Strategy in one or more regions. Check with the regional council for details. The woolly-headed thistle (Cirsium brevistylum) has wingless stems with cobwebby hairs, leaves with woolly undersides, uncommon in grassland, river flats and waste ground in southern NI. Cirsium Gr. 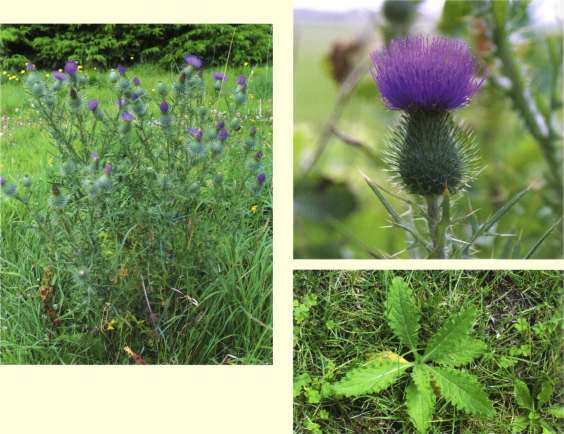 name for thistle; vulgare (Lat.) = common.